Gokwe-Nembudziya Member of Parliament, Justice Mayor Wadyajena has made startling revelations that the plot to impeach President Emmerson Mnangagwa foiled due to the lack of numbers. Posting on Twitter this morning, Wadyajena said the plotters threatened to kill him and harm his family for betraying their plan and allegedly alerting Mnangagwa, who has since abandoned his plan to attend the World Economic Forum, starting this week. "They threatened to kill me and harm my family. I stand by @edmnangagwa and wish they knew our isnt just a political relationship. However they try. we'l NEVER QUIT nor be intimidated. The plot is foiled, they lack numbers for impeachment and the devil isnt @ProfJNMoyo but amongst us." According to a source, Wadyajena and former Harare East MP Terrence Mukupe were initially included in the plan and pressed the panic button alerting Mnangagwa of the plot. Yesterday afternoon, Mnangagwa tweeted that he had aborted his plan to attend the World Economic Forum in Davos, Switzerland and is on his way home. Mukupe has since fled to Mozambique together with his family and before he left, he revealed that the next 72 hours will be crucial for the country, though he did not reveal much detail. 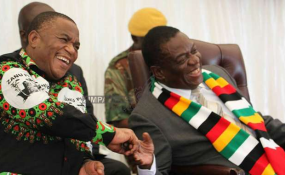 The plotters according to ZimLive had secured the support of 35 Zanu PF MPs and were hoping to get more numbers before roping in opposition MDC parliamentarians. Unconfirmed reports indicate that war veterans leader, Chris Mutsvangwa is part of the plot together with vice President Constantino Chiwenga and other senior Zanu PF officials. According to the Constitution of Zimbabwe, a sitting President can be impeached by a joint resolution of two thirds of both national assembly and senate.